My grandmother used to say Chinese New Year is a second chance at making our New Year’s resolution. But I’ve been so hopeless at sticking to them, even second chances don’t work for me. 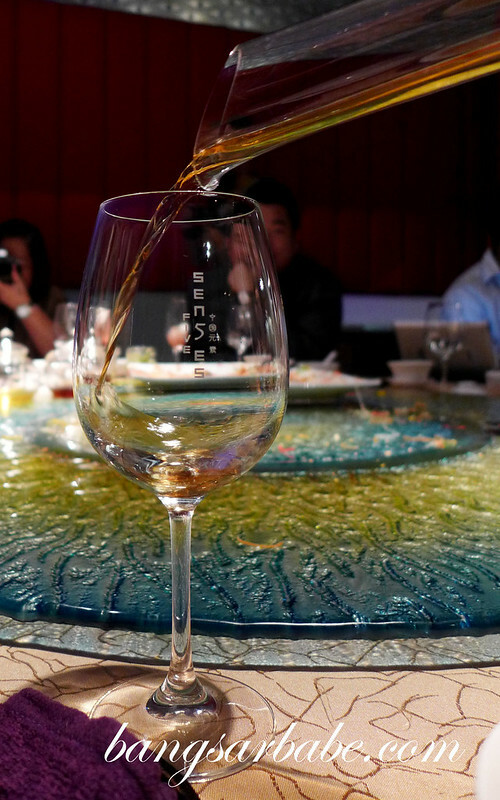 I always made a promise to my parents that I would eat less, but with set menus such as the Abundance Silver Dragon at Five Senses, that promise was quickly forgotten. I’m sure if my parents were to tag along that night, they would understand and cut me some slack. 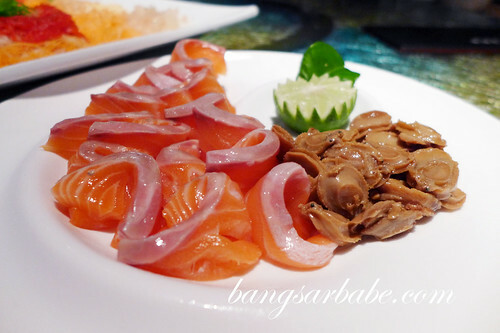 Dinner kicked off with the Jade Abalone and Norway Salmon Yee Sang, two of my favourite yee sang toppings combined into one dish. It was a sight to behold. Armed with large chopsticks, I tossed the yee sang as high as I could and wished for more prosperity and happiness this coming Chinese New Year. Next up was the Master Poached Sea Pearl Clam and Prawn in Superior Broth – a flavourful broth packed with seafood goodness. 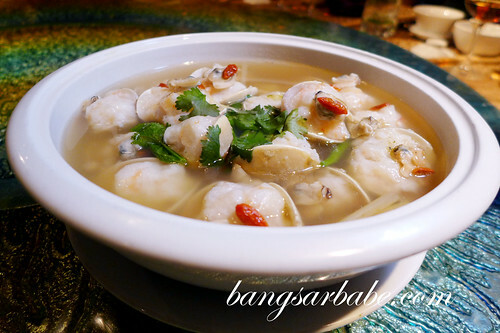 The mixture of clam and prawn was lightly cooked so it remained succulent despite being soaked in the hot broth. Smelt really good too. 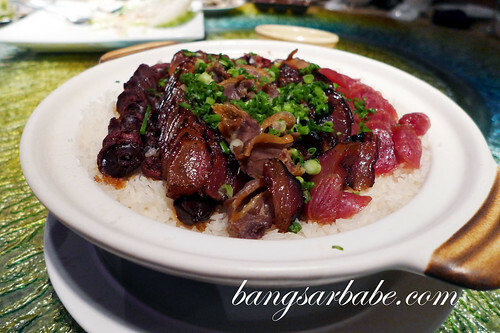 Ditch the chopsticks and tuck into the Charcoal Roasted “Sar Tian” Five Sen5es Pigeon. Those who attempted to be ‘proper’ soon gave up and used their hands. Eating roast pigeon with cutlery is never a successful attempt. And licking your fingers after you’re done makes the experience even more worthwhile, I feel. The pigeon was roasted till the skin was crisp and crackled in the mouth, but I found it a tad heavy on the seasoning. Perhaps to mask any gamey flavour of the meat. The others however, seemed to enjoy this very much. 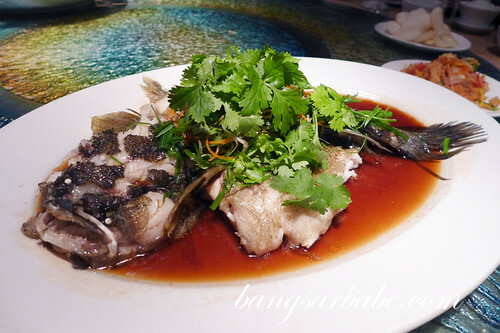 Cantonese Steamed Longevity Goby Fish in Soy Sauce was quite good, but go easy on the gravy. I took a bit too much and it was too salty. Moderation is key here; let the natural sweetness of the fish speak for itself. 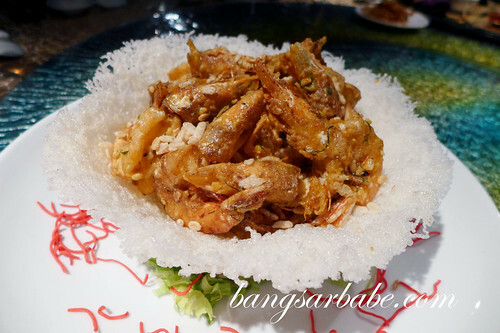 I rather enjoyed the Signature Golden Sand Sea Prawns with Crispy Rice Cereal. 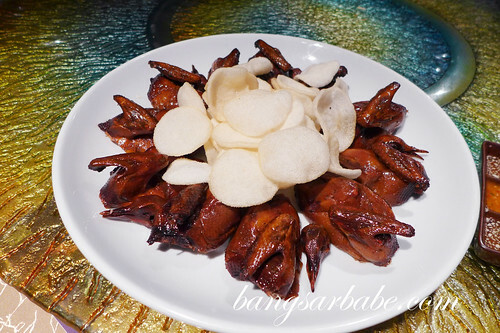 The prawn head was richly flavoured and creamy, and very addictive. That said, I would have preferred the prawns to be less thoroughly cooked. This one was bordering on the overdone side. Vegetables are my least favourite thing to eat, but the New Year Teeth Mushroom with Garden Vegetables and Roasted Pine Nuts was a lovely composition of textures. The vegetables were crunchy, with nutty accents from the pine nuts. I helped myself to another portion. Lap Mei Fan is often a feature during Chinese New Year, and this is also available in the Abundance Menu at Five Sen5es. Not bad, but not my favourite either. I found the duck meat a tad strong tasting, which overpowered the dish. This is a dish where you either love it or don’t. Dessert was the Japanese Sweetened Yam Gold Coin Chinese New Year ‘Nian Gou’, a sticky-sweet end to dinner. 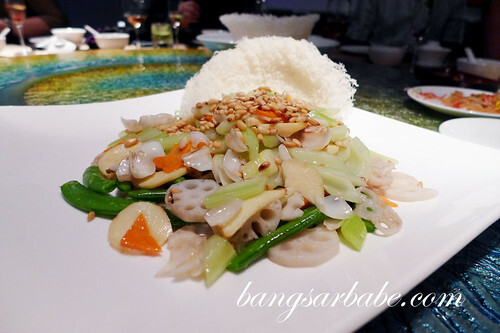 The desiccated coconut was an interesting addition, and added a touch of richness to the nian gou. 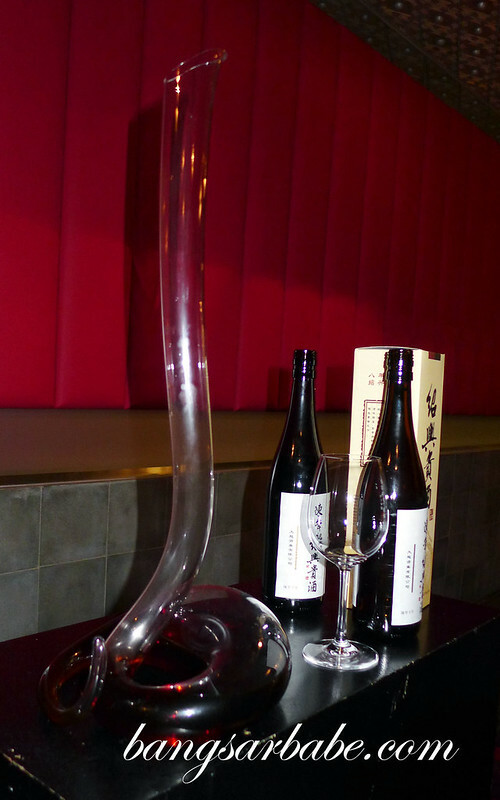 There was also Chinese wine, poured from a decanter shaped like a snake. I didn’t try any as the wine smelt too strong for a wuss like me, but from the looks of happy diners getting a few refills, this wine might grow on you. 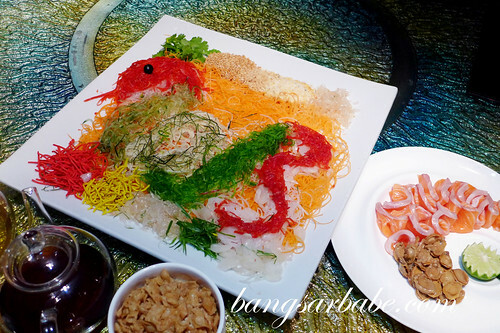 The Abundance Silver Dragon Set Menu is priced at RM1388++ per table of 10. The Happiness Reunion, Propitious Reunion and Blessings Reunion Set Menu ais priced at RM 880++ per table of 10, RM 988++ per table of 10 and RM 988++ per table of 10 respectively. 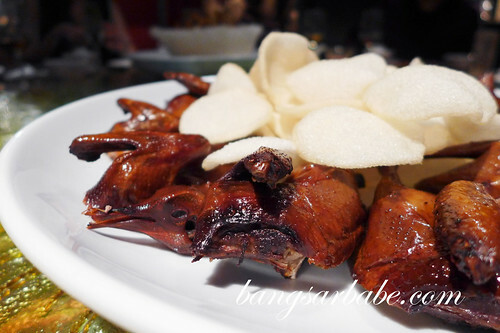 At that ends my Chinese New Year menu reviews for year 2013! Thanks! It was a lucky shot. Food was quite decent. 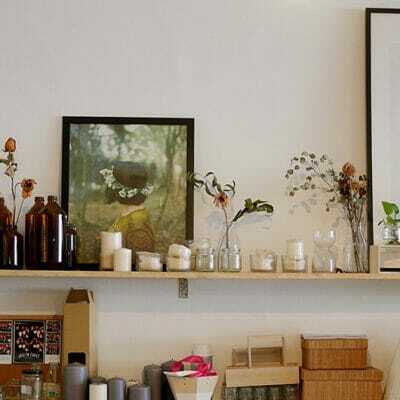 Hopefully such standard will be maintained during CNY period.